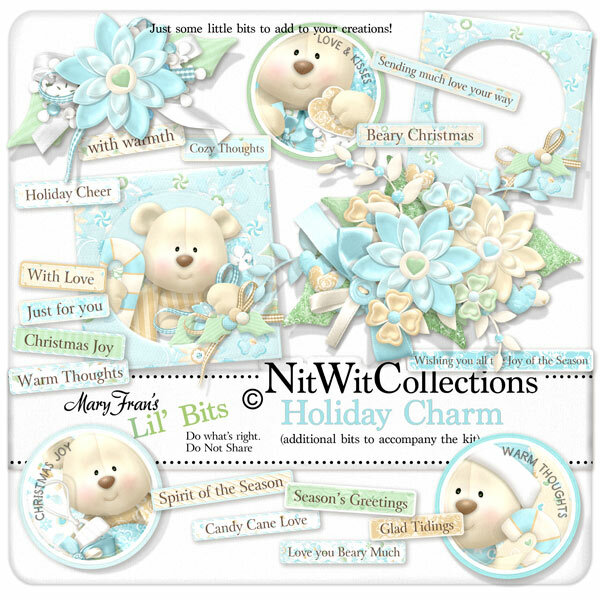 "Holiday Charm" Lil' Bits gives you even more options for the elements that you would like to use for your scrapbooking layouts and cards. Elements in the Lil' Bits are not included in the "Holiday Charm" FQB. 1 Circle element - "Christmas Joy"
1 Circle Element - "Warm Thoughts"
1 Circle Element - "Love & Kisses"
2 Floral Clusters - that are as good as any bouquet. See we're saving you a trip to the florists! 1 Square Element - with an inner circle to put in this year's Christmas photo? 15 Wordstrips with Christmas sayings and wishes to give you some layout and card making ideas.